1863 Gettysburg Before and AfterThe Hagerstown Community College is putting on an interesting Civil War Seminar on Saturday, March 23, 2013. 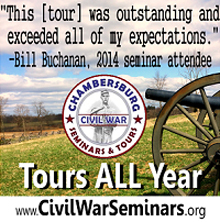 The topic of the seminar is before and after the Battle of Gettysburg. I’ll be presenting about the retreat from Gettysburg. I’ve included a link to the brochure for the event in this post. I hope to see some of you there. A couple of years ago, a prominent lawyer from Cleveland named Craig Bashein hired me to lead a personal tour for him and a friend, mostly of sites associated with the retreat from Gettysburg and the Wagon Train of Wounded. We had two very good days together, and I got to know Craig a little bit as a result. During our time together, Craig told me a little bit about the incredible collection of Civil War artifacts that he had accumulated over the years. From what he was telling me, it sounded like he had accumulated quite an impressive stash of artifacts. In late June 1863, Confederate Gen. Jubal Early didn’t just ride into Gettysburg to be part of a famous battle. His initial goal in coming north into Pennsylvania was to get local towns to provide food, boots, bullets and other supplies for his war-weary troops. So the subordinate of Gen. Robert E. Lee wrote to the Gettysburg leaders, “making demands of the town prior to the battle,” say Gettysburg National Military Park officials. That “demand letter,” which is of immense interest to historians and Civil War buffs, will be on display later this year at the National Military Park, along with dozens of other rare historical documents and records being donated by Craig Bashein, a lawyer and Civil War artifact collector from Cleveland. He praised the National Park Service for doing “a tremendous job of safeguarding and preserving many of our nation’s most treasured artifacts surrounding the Civil War and the Battle of Gettysburg.” He said the dozens of drawings and documents he is donating will let people further study and appreciate this important event in our history. He also called on other collectors to donate their historic and treasured pieces from the Civil War to the national park’s museum. A few of Mr. Bashein’s donations — some personal possessions of Union Gen. Alexander S. Webb, who took part in repulsing Pickett’s Charge — will be displayed in an exhibit called “Treasures of the Civil War,” which will open June 16. Dozens of displays and re-enactments are set for late June and early July at the military park, to mark the 150th anniversary of the famous Gettysburg battle, fought July 1-3, 1863. But most of the hundreds of items from Mr. Bashein will have to be slowly studied by military park historians and won’t become available to researchers or the public until sometime later this year, say park service officials. 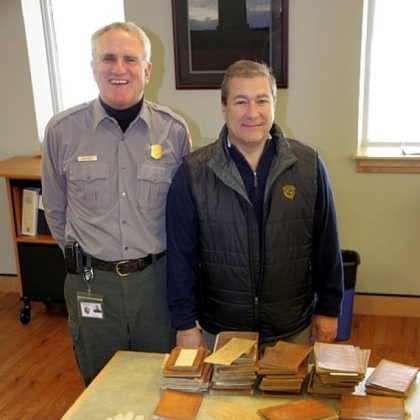 The Bashein wartime notes, artifacts, records and 64 unpublished sketchbooks “will offer enormous new opportunities to examine the Battle of Gettysburg and other Civil War battles that occurred from 1862 to 1865,” the park service said in a statement. Many of the materials were created by Emmor Bradley Cope, an engineer for the Union’s Army of the Potomac, as a way “to understand the topography, obstacles and the nature of the towns and countryside where these battles were occurring.” Many of the maps were made by Cope while riding the battlefields on horseback and were ordered by Gen. George Meade, the commanding Union general during the battle. “Since Gettysburg’s museum exhibits cover all the years of the Civil War,” from 1861-65, the artifacts from Mr. Bashein “will be invaluable in helping us tell the full story of the war, as well as providing unpublished resource materials that will benefit all those who study Gettysburg and the Civil War,” said Bob Kirby, superintendent of the military park. Many of the personal items are from Webb, who was given the Medal of Honor for gallantry for his actions when Confederate Gen. George Pickett unsuccessfully led his troops against Union forces on July 3, the final day of the battle. The Webb items include his pistol, a soldier’s hat, field binoculars and a medal from Gen. Meade for meritorious service. • A map of the Gettysburg battlefield, done by Capt. J.D. Briscoe, an aide to Union Gen. David Birney. It has hand-drawn notes of where troops were positioned. The map was used by Birney during testimony about the battle to a Congressional committee in the spring of 1864. “This map is believed to be one of the first battlefield maps of Gettysburg ever prepared,” the park service said in a statement. • The archives of David Kendlehart, a Gettysburg burgess, made during the battle, which include the “demand letter” from Early. • Leather gloves worn by Philip Sheridan, a Union cavalry general. • An engraved silver pocket watch given to Union Gen. Henry Halleck by his staff officers. That’s GNMP Superintendent Bob Kirby on the left in the photograph, and Craig on the right. The 64 sketchbooks mentioned in the article are on the table in front of Messrs. Kirby and Bashein. Kudos to Craig for ensuring that his incredible collection is not only preserved, but that it will also be made available to the public (and especially those items that will be made available to researchers). Well done, sir! You Stink! now available in Kindle edition! >You Stink! 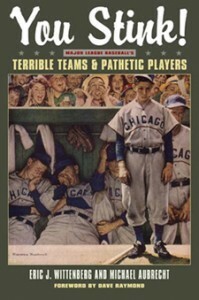 Major League Baseball’s Terrible Teams and Pathetic Players is a Homerun! There are countless volumes celebrating the best teams in professional baseball. Unfortunately, winning represents only one side of the game. For every champion’s record-setting season, there has been an equally memorable story of defeat. These teams and their shameful contributions to America’s national pastime have been a neglected topic in the annals of baseball history. Until now. You Stink! includes franchise origins, detailed stats, player profiles, photos, and more, as well as a collection of long-format essays in a “Hall of Shame” that recognizes some of the worst moments ever witnessed on a ball field. For more information, visit the You Stink! Blog or You Stink! Facebook page. 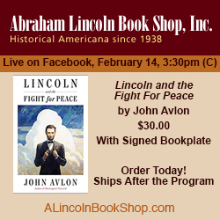 Authors are now booking signings and speaking engagements for 2013. Please contact me via this blog if you are interested. Here’s what some readers have said about You Stink! (Culpeper, Va.) – The Civil War Trust, America’s largest nonprofit battlefield preservation group, today announced the that it has secured a contract with a Culpeper County landowner to acquire 61 acres of core battlefield land at Fleetwood Hill on the Brandy Station Battlefield. This is the first step in what is anticipated to be a national fundraising campaign to ultimately preserve this site and open it to the public. This opportunity comes just a few months before 150th anniversary commemoration of the battle, fought on June 9, 1863. Although pleased with the agreement, Lighthizer cautioned that “several steps remain before the transaction is completed and the property can be considered preserved — chief among them raising the $3.6 million necessary to formally purchase the land.” He noted the Civil War Trust’s intention “to launch a national fundraising campaign next year with the aim of raising the money in time for the 150th anniversary of the battle in June 2013. Further details of this exciting opportunity — including mechanisms for public involvement and donations — will be announced in the new year, once additional groundwork for the project is laid. In the 1990s, Brandy Station was also the scene of a high-profile preservation battle. At one point, 1,500 acres of the battlefield were rezoned to allow for light industrial development. Later, a 515-acre Formula One auto racetrack was proposed for the site. However, due to the persistence of preservationists throughout the country, plans to develop the battlefield were thwarted. Today, the Civil War Trust owns 878 acres of the Brandy Station Battlefield that are open to the public; interpretation of the site includes educational signage, walking trails and a driving tour. The Civil War Trust has been also been actively involved in preserving land at other battlefields in Culpeper County. This summer, on its 150th anniversary, the Trust announced an effort to preserve an additional 10 acres on the Cedar Mountain Battlefield. More recently, the Trust completed a national fundraising campaign to place a perpetual conservation easement on 964 acres at Kelly’s Ford, site of the war’s first large-scale cavalry engagement. These transactions were made possible through the generosity of Trust members and the financial support of matching grants from the American Battlefield Protection Program, administered by the National Park Service, the Virginia Department of Historic Resources and the Virginia Department of Transportation. 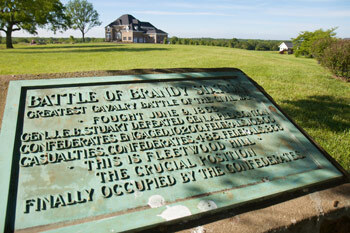 Learn more about the Battle of Brandy Station at www.civilwar.org/brandystation. The Civil War Trust is the largest nonprofit battlefield preservation organization in the United States. Its mission is to preserve our nation’s endangered Civil War battlefields and to promote appreciation of these hallowed grounds. To date, the Trust has preserved more than 34,000 acres of battlefield land in 20 states, and nearly 3,000 on important Culpeper County battlefields like Brandy Station, Cedar Mountain, and Kelly’s Ford. Learn more at www.civilwar.org, the home of the sesquicentennial. I congratulate Tony Troilo for doing the right thing. 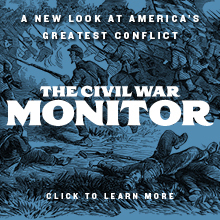 And I congratulate the good folks at the Civil War Trust for their diligence and dedication to making this happen. But most of all, I congratulate Clark B. “Bud” Hall for making this happen. This–the capstone of Bud’s preservation career–would not have happened without his zealous advocacy, leadership of the “board in exile” of the Brandy Station Foundation, and for his dogged perseverance with the Trust to ensure that this deal got done. We’re only part of the way there, though. The heavy lifting must now be done. We have $3.6 million to raise. Every one of you who regularly reads this blog and has asked me what you could do to help–the time is now for you to open your checkbook and help us to raise the money. This opportunity will never come around again, and we must do all we can to make this happen now. Please contribute whatever you can to help to save the single most fought over piece of ground on the North American continent. Beside being fought over in four major engagements, this parcel also housed Maj. Gen. George G. Meade’s headquarters, Army of the Potomac, for the army’s winter encampment in 1863-1864. You would be hard-pressed to identify a more important parcel of unprotected ground anywhere in this great land of ours, and I encourage each and every one of you to do what you can to help. 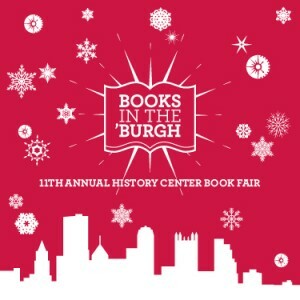 For those of you in the Pittsburgh area, this Saturday, December 1, 2012, Michael Aubrecht and I will be signing copies of our book, You Stink! Major League Baseball’s Terrible Teams and Pathetic Players at the Heinz History Center’s annual book fair for books related to topics pertinent to Pittsburgh, Books in the ‘Burgh. We will be signing there from 10:00-3:00. Please come by and say hello if you can! This Saturday, October 13, 2012, is Ohio Day at the Antietam National Battlefield. I will be speaking at the Antietam battlefield Visitor Center at 11:00 this Saturday morning on Ohio at Antietam as part of the Ohio Day festivities. If any of you are around and might be able to make it, I hope to see you then and there. Mark Holbrook of the Ohio Historical Society will also be speaking, at 2:00, on the future presidents from Ohio who served in the Civil War. Two, William McKinley and Rutherford B. Hayes, were both at Antietam. Also, the Ohio Civil War 150 Traveling Exhibit will be set up in the Visitor Center for the day, so please take the time to check out this interesting exhibit of how Ohioans impacted the Civil War. Antietam has long been one of my favorite battlefields, and I enjoy any opportunity to visit it. Come see me there! On Thursday, September 20, I spoke to the Powhatan Civil War Roundtable. We were supposed to tie the speaking engagement to a visit with some Virginia friends, but the visit had to be postponed. That meant that Susan and I had to run-and-gun the trip. We drove out on Thursday and back on Friday. On the way back, we made a brief visit to the battlefield at White Sulphur Springs, where I paid my respects to Capt. Paul Freiherr von Koenig of William Woods Averell’s staff, who was killed while leading a flank attach on the afternoon of the first day of the battle. Susan took the photo that appears here. 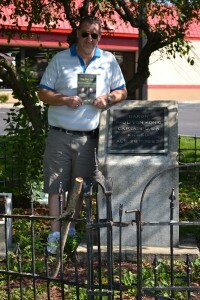 I am standing next to the monument to von Koenig that marks the spot where he fell. This monument was erected by Bvt. Brig. Gen. James M. Schoonmaker in 1914 (at Schoonmaker’s own expense) and occupies the sport where the German adventurer fell. Sadly, much of the White Sulphur Springs battlefield has been destroyed by the development of a shopping center on the spot. The monument to von Koenig rests just outside a Hardee’s fast food restaurant, and if one did not know that this shopping center sits in the middle of a battlefield, there is no way to know. Uncovering the facts von Koenig’s life story-and the story of how he died–and telling it in an appendix to my book on the Battle of White Sulphur Springs is, perhaps, the single piece of my historical work of which I am most proud (it turns out that Paul von Koenig became good personal friends with future President of the United States, Brig. Gen. James A. Garfield, which is one of the things that got me interested in Garfield’s service in the Civil War). I owe a great debt to the current Baron von Koenig, whose name is Dominik, and his son Florian, for helping me to put meat on the bones of this otherwise forgotten soldier. 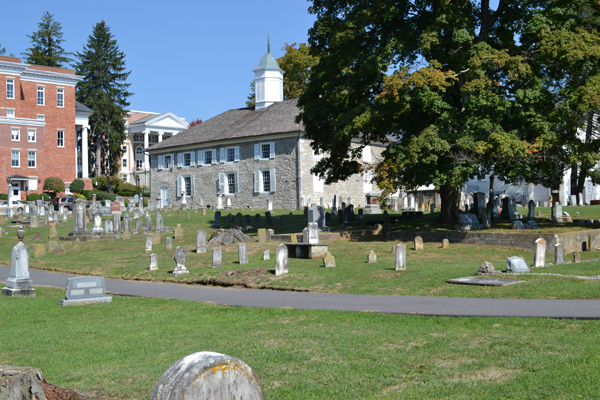 We also stopped at the Old Stone Presbyterian Church in the lovely old town of Lewisburg, West Virginia. The church and its cemetery are pictured here. For those unfamiliar with the Battle of White Sulphur Springs, the law library in the Greenbrier County Courthouse in Lewisburg was the object of Averell’s unsuccessful raid at the end of August 1863. There was one grave that I wanted to visit there, of an officer of the 22nd Virginia Infantry, who was killed during the fight at White Sulphur Springs. Along the way, we found the grave of another officer of the 22nd Virginia who played a significant role in the Confederate victory at White Sulphur Springs. This is the grave of Maj. Robert Augustus Bailey, who was a Lewisburg native. Nicknamed “Gus,” Bailey was born in Lewisburg in 1839. He was the son of prominent Circuit Judge Edward P. Bailey, which made his defense of the law library all the more notable. 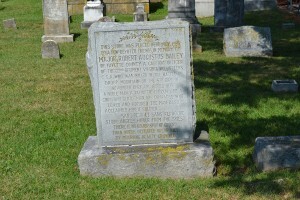 Gus Bailey became a lawyer himself and was practicing his trade in Fayette County in what became West Virginia when war came. Prior to the outbreak of the Civil War, he served as a captain In the 142nd Regiment Virginia Militia, 27th Brigade, 5th Division. With the coming of war, Bailey became captain of the Fayetteville Riflemen in Charleston on June 6, 1861. The Fayetteville Riflemen eventually became Company K, 22nd Virginia Infantry. The regiment was commanded by Col. George S. Patton, a prominent attorney from Charleston. On August 26,1861, Bailey led a small scouting party to determine the feasibility of placing artillery to shell the Federal camps at and near Gauley River Bridge. Confederate Brig. Gen. John B. Floyd implemented Bailey’s plan during the fight at Gauley River Bridge in November 1861. Bailey was promoted to major on November 23,1861, and often commanded the 22nd Virginia (or elements of it) in various battles, receiving particular notice for his bravery at Fayetteville, (West) Virginia, September 10,1862. On March 1, 1863, he was major in command of the Department at Lewisburg, (West) Virginia. He led a battalion of the 22nd Virginia at White Sulphur Springs, and played an important role in the Confederate victory there. Bailey was trying to rally his defeated men at the November 6, 1863 Battle of Droop Mountain when he was mortally wounded. After saving the regimental colors, he was waving the flag when struck by the ball that took his life. 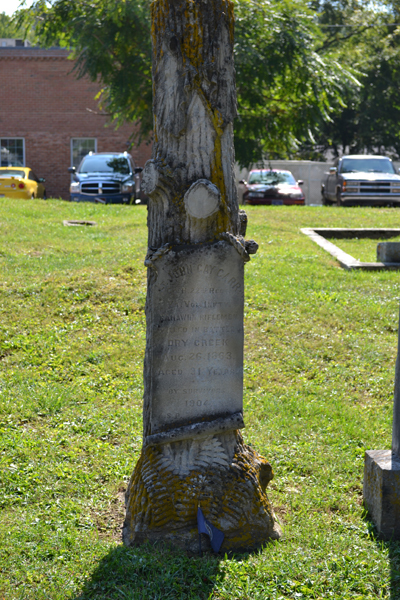 He lingered for five days before dying, and was then buried in the Old Stone Church cemetery in his hometown of Lewisburg. Bailey played an important role in the story of the Confederate victory at White Sulphur Springs, and I just happened upon his grave serendipitously. I’m glad I found it and was able to pay tribute to a gallant Southern soldier who received his mortal wound while doing his duty. 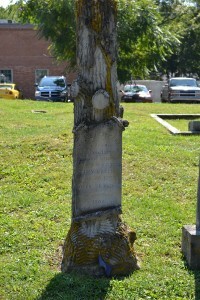 In 1904, his friends contributed funds to raise the handsome tree trunk monument that stands silent sentinel over his grave in the cemetery of the Old Stone Church, which is pictured herein. You can see larger versions of the four images that appear in this post by clicking upon them if you so desire. The story of the Civil War in West Virginia has long gotten short shrift, but it was truly a civil war there, with neighbors fighting each other to the death. If you’re interested in learning more, I recommend any of Terry Lowry’s excellent works on the battles fought in the Mountain State. Susan and I went out of town this weekend, and when we got home this afternoon, she noticed a box on the front steps of our house. When she grabbed it, she saw that it was from the Kent State University Press, which could mean only one thing: I had gotten my author copies of You Stink! Major League Baseball’s Terrible Teams and Pathetic Players! 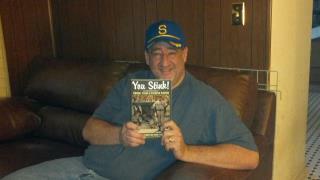 After 38 years of waiting, I can finally hold the culmination of my idea. I’m wearing the hat of the 1969 Seattle Pilots in the photo. The Pilots are one of the teams profiled in You Stink!, so I thought it appropriate to wear their hat for the first photo of me holding a copy of the book. In my humble opinion, that’s the ugliest hat ever worn in the history of the Major Leagues, so it’s also appropriate for the subject matter of the book. Please visit our You Stink!blog for more fun stories, and please contact me if you’re interested in acquiring a copy of the book. 2012 is a memorable year for the commemoration of historical events. The sesquicentennial of the Civil War continues. The bicentennial of the war of 1812 is celebrated this year. And today marks the centennial of the sinking of the R.M.S. Titanic. Given my lifelong fascination with the sinking of the Titanic, I would be remiss if I did not at least mention it here, off topic as it may be. I’ve long been fascinated by shipwrecks. Perhaps it stems from the fact that the anchor of the U.S.S. Maine rests in my hometown of Reading, Pennsylvania, and I went on a childhood search to learn the story of that big anchor in the park. I have a small shelf full of books on the sinking of the Titanic, and we made a special trip to Chicago to see the traveling museum exhibit of artifacts from the sunken liner. The arson fire that destroyed the Morro Castle in 1934 has long fascinated me. I have several books on the sinking of the Andrea Doria in 1959. Even the sinking of the Edmund Fitzgerald intrigues me. I have read several books on its tragic ending. I’m sure that when the books begin to appear on the wreck of the Costa Concordia, I will invest in them too. None, however, hold sway over the public’s imagination like the Titanic. Certainly, James Cameron’s movie stirred another generation’s fascination. Personally, I could have done without the distracting love story, but the footage of the shipwreck and Cameron’s slavishly and eerily accurate recreation of the ship made the mawkish story of Jack and Rose tolerable. The scene at the beginning of the movie where the image transitions from the shipwreck to the promenade deck of the recreated ocean liner alone was worth the price of admission. I’ve read a bunch of books about the tragic ship and her only voyage, and I find myself just as drawn to it today as I did the first time I ever read A Night to Remember as a boy. The story of the bravery of the musicians, as one example, as they continued to play even as they knew they were doomed, has always been very moving to me. The courage, bravery and dignity of the male first-class passengers, such as John Jacob Astor, one of the wealthiest men alive, as they stepped aside to allow women and children to board the lifeboats awes me. The quiet dignity of these men changing into their finest clothes so that they could die like gentlemen inspires me. The story of Isadore and Ida Strauss choosing to die together even though Ida could have taken a spot in a lifeboat has always moved me too. The story of the cowardice of Bruce Ismay, who refused to do the honorable thing and go down with his ship equally repels me. The human toll is what I find most fascinating. And being a dog lover, the story of the dogs of the Titanic is equally compelling. I have always wanted to visit the cemetery in Halifax, Nova Scotia, where so many of the victims of the disaster were buried, and it’s on my bucket list of places to go. Often overlooked in the tragedy of the Titanic is the eerily similar fate of her sister ship, the R.M.S. Britannic. Britannic was the largest of the three sister ships, and she also sank. She was launched just before the outbreak of World War I, and was used as a hospital ship during the Great War. In that role she struck a mine off the Greek island of Kea, in the Kea Channel on November 21, 1916, and sank with the loss of 30 lives. Only the R.M.S. Olympic, the third sister ship, managed to avoid the fate of her sisters. Let’s not forget the 1,514 souls that departed this earth one hundred years ago today when the Titanic sank. As some of you may recall, in January of this year, I commenced an experiment. I purchased a black and white Nook with the intention of using it to download public domain regimental histories and the like from Google Books for use in my various projects. 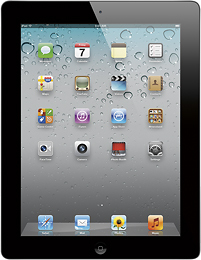 A little over a week later, and on the recommendation of Steve Stanley, I exchanged it for a Nook Color. I then began to experiment with it in the hope that I could make it work the way that I hoped to use it. The experiment proved to be terribly frustrating.